888 Poker does not accept players from the United States. The recommended site for your country is Americas Cardroom. Poker players from the United States, please pay attention. The best US friendly poker site of the moment is Ignition Casino Poker, which was previously known as Bovada. This site has the best traffic and not only does it come with a great sign-up bonus, it also has privileges such as Bitcoin deposits and fast payouts. Please read our Ignition Casino Poker review or have a look at our list of US friendly poker sites we recommend. The 888 Poker site has developed a strong reputation in recent times and it manages to stand up to close scrutiny alongside the other range of 888 gaming sites. There is a lot to choose from and it is easy to see why some players will choose 888 for all of their online gaming options. 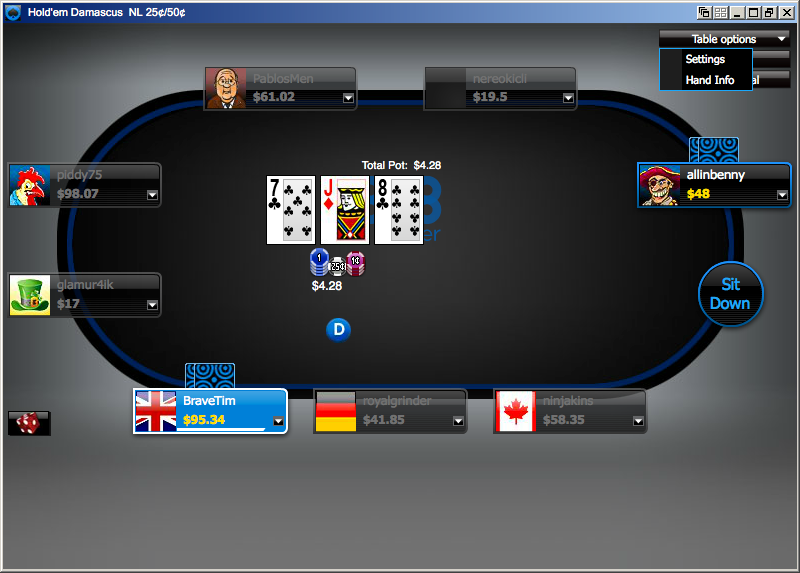 If you have played 888 but not yet tried the 888 Poker option, you should feel right at home. Even better news comes with the fact that there is an 888 Poker for Mac option, so if you are on the lookout for the best Mac poker option, this may well be the site for you. With 888 Poker now also providing mobile poker options, which are available for the iPhone and the iPad, it is clear that the site is happy to deal with Apple players. Therefore, no matter how you prefer to play online poker, including on the Mac, you should be able to get involved with the fun and games that are available. When it comes to the poker software provided by 888 Poker, it may be that you need to re-evaluate your opinion of the site. It is fair to say that a few years back, 888 Poker had difficulties but with upgraded software package (Poker 6), there has been a marked improvement in the poker offerings. It is now possible to choose 3D table graphics, integrated casino play, the cashier that is always visible, improved layout, improved search functions and an increase in the options for multi-table play. It would be fair to say that the 888 Poker site is one of the most trusted poker sites you can find and a lot of this is down to the security provided by the software. Players need to know that they will be safe when they play online and the software provided by 888 Poker caters for this. The 888 Poker site provides a good run-down of the deposit and withdrawal methods that are available to players on the site. The vast majority of these options are acceptable for both but there are some methods which are only suitable for deposits only. The methods suitable for both include Visa, MasterCard, bank transfer and numerous e-wallet options like PayPal, Neteller, and Skrill. The vast majority of these methods carry no transaction fees and your money will be in your 888 Poker account immediately. This is a great boon if you are in a rush to play poker. 888 Poker rewards new real money players with a complete welcome package that includes a 100% deposit bonus, seven entries into a series of $500 First Depositors Freerolls, two entries into two $1,000 Depositors Tournaments, and one entry into a Depositors’ Challenge Tournament. Getting a bonus before you make a deposit is always going to be of interest to online poker players so this is the sort of bonus that poker players need to be on the lookout for. The equivalent for 888 Poker’s no deposit bonus in British Pounds is £20. At the time of reviewing the site, the London 2012 Olympics were in full swing and many online gaming sites were trying to cash in on Olympic fever. Due to the strict sponsorship laws revolving around the games, it was difficult for sites to tie in their promotion to the Games because they couldn’t mention certain words or use certain logos but athletes were certainly suitable to be used. This is why 888 Poker has a Race For The Ace promotion going on! The promotion provides £5 free without a deposit and the chance to play in free tournaments where $50,000 would be up for grabs. When it comes to the sort of poker games on offer from the 888 Poker site, you will be glad to know that Texas Hold ‘Em, Omaha, Omaha Hi/LO, Seven Card Stud and Seven Card Stud Hi/Lo are all included on the site. 888 Poker has always provided players with chances to win holidays and trips on site. Most of these tournaments came in the form of satellite events for major poker tournaments but sometimes the site provides a little bit more. One of the recent tournaments allowed players to play their way to the 888 Poker Morocco Tour Championships, which also enabled players the chance to take in the Euro PGA which was taking place at the same time. 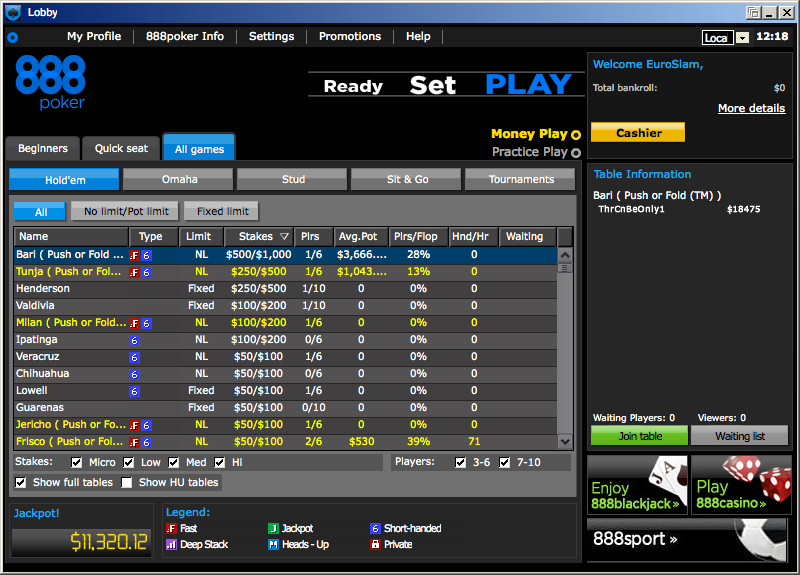 An increasingly popular tournament in the 888 Poker arsenal is the team tournament games which take place twice a week. Here, poker players select a team they want to represent (from the English Premier League, German Bundesliga or Spain’s La Liga) and then play with fellow fans hoping to rack up points for their team and beat their opponents. There is a lot of fun in the chat room in this tournament but there is also serious cash to be shared out between the winning teams. 30% of the entire prize pool for each game is shared out between the players of the winning team. Another sporting benefit comes in the tournament that allows you to win a share of a racehorse! One £3,000 share in a racehorse is up for grabs every fortnight and this will ensure the lucky winner then receives 5% of the winnings picked up by the horse in its career. There are other benefits available like stable visits, gaining entry to major horse racing events and even being provided with VIP owners level access to some of the big horse races of the year. With the chance to win this prize arising every two weeks, it is certainly something for 888 Poker players to aim for! This series of poker tournaments follow the template laid down by so many online poker sites and no doubt Sunday is the day when poker players get their chance to enjoy the biggest games. There are always tournaments to choose from on the 888 Poker site but if your time is at a premium or you want to make sure you are playing for the biggest prizes, Sunday is the day you need to keep free for poker commitments. Furthermore, 888 Poker offers Highroller Tournaments, Low Buy-in Tournaments, and other Special Tournaments each day, which are outlined in the table below. 888 Poker is also pushing the mobile play options so if you are looking to enjoy poker fun on the go, this could definitely be the option for you. There is no doubt that the way that we play online poker is changing greatly and anything which helps poker players to make more use of their time has to be seen as a positive step. Having the 888 Poker for Mac option is one great benefit of the site but knowing that it is available to play on smartphones and tablets is a huge bonus too. There is a chance to get rakeback of 36% on the 888 Poker site, which provides another strong reason for signing up for the site. When some of the major online poker sites are reducing the opportunities to pick up a rakeback option, it is good to see that there is still the option to pad out your bankroll on a poker site. There are 500 different levels in 888 Poker Club and players will climb up while they play and accumulate Poker Points. When climbing up in levels players receive Gold Tokens, which can be redeemed in the 888 Poker Shop. Given the huge popularity that 888 Poker holds, there is no doubt that there are a lot of players who choose this option. The fact that there is an 888 Poker for Mac option means that even more players can get involved with the fun and enjoy what is on offer. With great games, bonuses, and plenty of tournaments to enjoy, the 888 Poker site is a strong choice for a great number of online poker players.